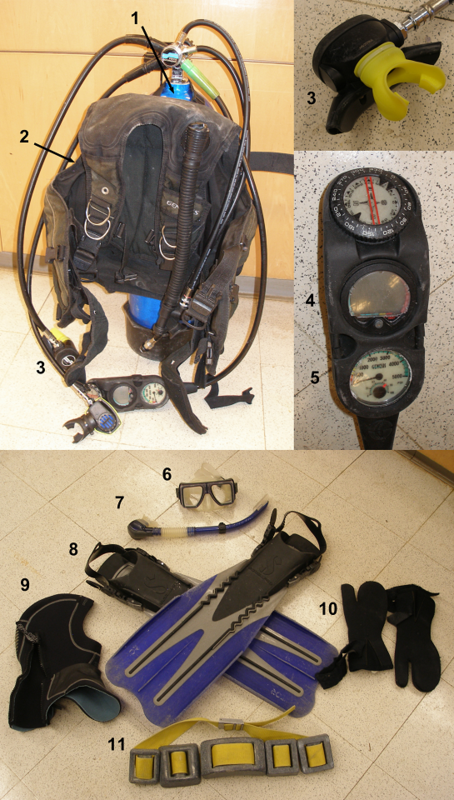 One of my favorite tools to use in my research is scuba diving. In case you were wondering where the name comes from, it’s actually an acronym for Self Contained Underwater Breathing Apparatus. Field work underwater is a lot like terrestrial field work, except with more serious time limitations. Depending on the depth, a tank of air can last from about an hour at 20 feet deep to about five minutes at 120 feet. Time can also vary depending on the diver (some people use more air in a breath than others). There’s also nitrogen accumulation to consider. When you breathe pressurized air, your body absorbs nitrogen. Too much nitrogen can lead to air bubbles forming in the blood (this is called decompression sickness, or the bends). Luckily, this absorption is reversible but does take some time to release after a dive, meaning you can safely make three dives per day in most cases. Because of the time constraints, the key to a successful research dive is planning. Every member of the team needs to know exactly what they are doing. What does it take to go diving? Well for one thing, you need air; a steel or aluminum tank will do the trick. One tank holds about 75 cubic feet of air (about 3000 pounds per square inch). Next, you need to reduce the pressure of the air so that you can breathe it using a regulator. Then there's a gauge so that you know how much air you have left, a computer to tell you your depth and calculate the amount of nitrogen you've absorbed, and a buoyancy compensator to keep you floating freely in the water. Finish it off with a mask, a pair of fins, and a wetsuit, and you're ready to dive. Of course if you're going into cold water (like we have here in New England) you might want to wear a hood, gloves, and maybe a drysuit. A weighted quadrat, a slate, and a couple of pencils. Believe it or not those are just ordinary #2 pencils. The rest of the equipment is pretty simple, and should sound pretty familiar. We use plastic bags to collect specimens, transects and quadrats, and even pencil and paper (well, pencil and a slate). To learn more about diving in an estuary check out Helen's post about her work in Great Bay, NH. Also check out Wikipedia's great page about the history of diving technology. Finally, a great little movie about the life of a professional diver. It's amazing to think of someone actually diving in some of that equipment.